LA BELLA TAVOLA - APRONS are available for purchase. Our local MLA's were instrumental in recently securing provincial government funding of $50,000 for the Clubhouse Kitchen Renovation project. KCIC - La Bella Tavola Cooking Class would not be possible without the support of our Club Executive and the funding to renovate the kitchen...GRAZIE!!! Marianna Pezolli (La Bella Tavola), Joe Iafrancesco (President), Ben Stewart (MLA Kelowna-West), Lina Nanci (La Bella Tavola), Steve Thomson (MLA Kelowna-Mission), Giannina D'Orazio (La Bella Tavola), Patti DiMaria (La Bella Tavola), Mary Woolridge (La Bella Tavola), Rosann Nanci-Carl (La Bella Tavola) and Norm Letnick (MLA Kelowna-Lake Country). “La Bella Tavola” (The Beautiful Table) plays a very important role in every Italian household. It is a sacred place where loved ones gather, where decisions are made, news is shared, songs are sung, food is prepared and enjoyed together and most importantly traditions are passed down from generation to generation. Eat well and join us at our Beautiful Table! Mangiate bene! Venita alla nostra Bella Tavola! The Kelowna Canadian Italian Club is passionate about "Preserving Our Culture and Heritage". We are a nation of food lovers with a passion to share it with those we care about. We invite you to take a seat A La Bella Tavola. Join us as we visit the many beautiful regions of Italy and learn about Italian traditions, culture, the people, and our love for the food from our country. We have guest presenters from various regions demonstrating secret recipes handed down for generations. Simple techniques with simple kitchen tools that create elegant and sophisticated flavours. Each 3-hour session will be a trip through an Italian vegetable garden, a well-stocked food pantry and an abundant vineyard. We will learn traditional techniques, discover new spices and herbs, and learn the traditions of Italian holidays and lifestyle. Get ready to learn some Italian words and phrases you can use at your very own table. 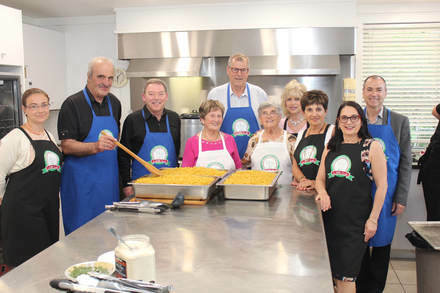 La Bella Tavola - Italian Cooking Classes are made possible with the support of the Kelowna Canadian Italian Club and a small group of dedicated volunteers. Our talented presenters come to La Bella Tavola with years of experience and their love for Italian food. They each bring traditional recipes and techniques from different regions of Italy. Students arrive at 5:15pm to prepare for class to begin at 5:30pm SHARP. Appetizers and beverages will be served to start off the evening and then we roll up our sleeves and get ready to cook! Each session will feature one main Pasta recipe. This is a hands-on class and therefor students will be mixing, kneading, rolling and forming the pasta. Following the instruction portion, the class will then be seated A La Bella Tavola to enjoy our fresh pasta, beverages, dessert and a cup of espresso. Each class will conclude with a cultural presentation. Complimentary recipes from the class will be available and additional LA BELLA TAVOLA aprons are available for purchase at time of registration or at the first class you attend $20.00 plus GST ($21.00). ONLINE REGISTRATION IS OPEN - SUNDAY, MARCH 3 at 9:00am. Visit the Kelowna Canadian Italian Club website (kelownaitalianclub.com) and submit the REGISTRATION REQUEST FORM (EVENTS & ACTIVITES – LA BELLA TAVOLA – COOKING CLASSES). Each class will be filled on a first come first served basis. KCIC will contact you directly to confirm information and collect payment information. KCIC will accept e-transfer, cash or cheque for payment. You can register for ONE or more classes (each class requires a separate form). Class fee is non-refundable however it is transferable. Students must be 19 years or older to attend classes. There will be a WAITLIST created once the class limit has been reached. Should you have food allergies, we recommend you contact us directly before registration at kciccookingclass@shaw.ca. Please wear closed toe shoes to the cooking classes. No need to bring any supplies – all tools and ingredients are supplied.